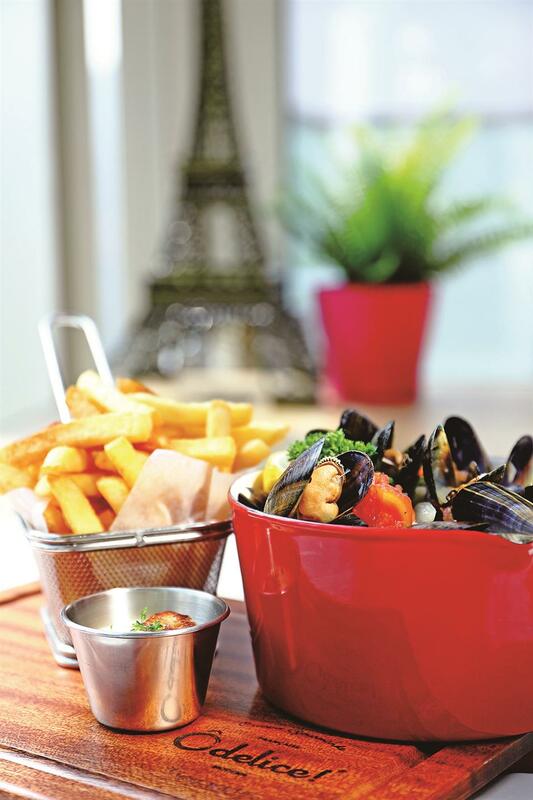 Taste of France with Asian twist at Odelice! Located at the busy corner of Xinle and Donghu roads, Odelice! is a French restaurant offering a plethora of plates and drinks, and frequented by the neighborhood's trendy locals. Located at the busy corner of Xinle and Donghu roads, Odelice! is a French restaurant offering a plethora of plates and drinks, and frequented by the neighborhood’s trendy locals. After a recent renovation, the space has been upgraded into a brighter, more lively spot with a new facade brightened by a Mediterranean blue, which contrasts to a Parisian-style subway ceramics interior, bistro sofas and a tiled floor. Adaptable as an all-day casual French restaurant, Odelice! promotes a relaxed dining experience with contemporary creations and traditional Gallic recipes that are loved worldwide. “A ‘delice’ in French means a treat, delicious food/drink. ‘O’ is like an abbreviation of ‘au’ in French, roughly meaning ‘at a place.’ So our restaurant name simply indicates a place where people can enjoy delicious food,” said founder Julien Draeger. Signature dishes include a range of galettes made with healthy, gluten-free buckwheat flour. Sharing is another prominent feature, for which they have come up with a selection of starters and mains made perfect for sharing. The affordable eatery doesn’t compromise on its ingredients. They use as many fresh ingredients as possible to ensure maximum flavors. “We create dishes featuring well-liked ingredients by local diners, balancing flavors to appeal to Asian palettes but prepared using French recipes,” Draeger said. 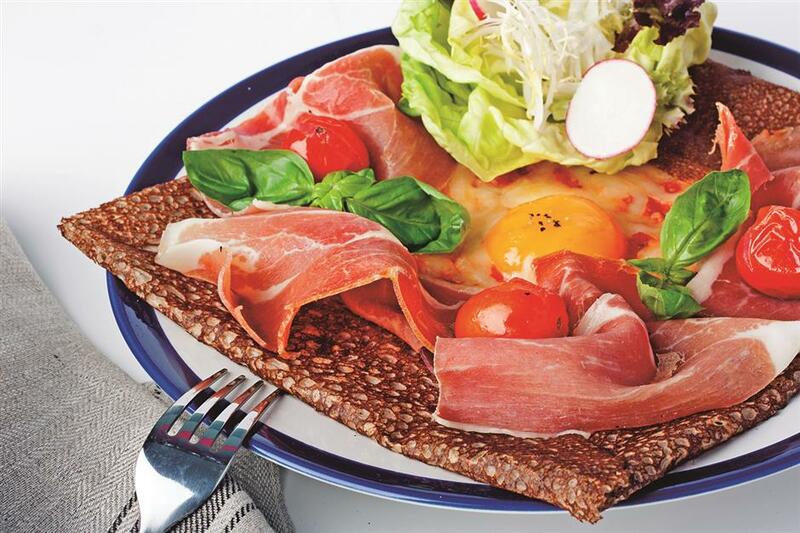 Signature dishes include a range of galettes made with healthy, gluten-free buckwheat flour. This savory crepe is an indulgent treat at any time of the day. Try the Parma ham galette, featuring creamy egg, melted mozzarella, sweet and tangy tomato confit, fresh basil and thin slices of Parma ham. Galettes are fast and made-to-order at Odelice! Homemade foie gras terrine is also a must-order if you like authentic French recipe. The chef uses brandy and sea salt to give the extra depth to the foie gras: slow-cooked in the kitchen and served with brioche bread and home-made apricot chutney. French blue mussels are a seasonal item imported from Europe twice a week that are loved by many locals. The premium live mussels have a wonderful taste of the sea, cooked in a traditional creamy white wine sauce with onions, garlic and herbs. Some may think the creams are somehow overly used yet it is just as it should be. “We are optimistic about the future of our French casual dining brand in China — making French dining approachable for all and available all day,” Draeger added.